New Val Cox Frit Colours! Originally published at Two Glassy Ladies. You can comment here or there. Well, here is something to get excited about – a whole new set of blends from Val Cox Frit! I just got mine last week so all I have had time to do so far is spacers, but I am absolutely loving each and every one of these blends, and I can’t wait to see more of them… when I get caught up on my orders I will be doing a ton more experimenting! And a few more Creation is Messy colours! I think this is the last of the new colours. Frantz has some of the 2015 colours in stock now! Here are some more of the new CiM colours – out later this month I think? I only had a small amount of each to play with and am looking forward to getting my hands on more! The new colours are (almost?) out from Creation is Messy! I know that Frantz should have them all in stock by mid/late February. I was lucky enough to get my hands on them a little early so here are some previews. Definitely some of these that I will be adding to my regular lineup. Are there any here that you would like to see more of? More photos coming soon as I still have quite a few rods to try out My favorites so far are Aegean, Frozen, Duck Egg, Tortoise, Nectar, and Pollen. 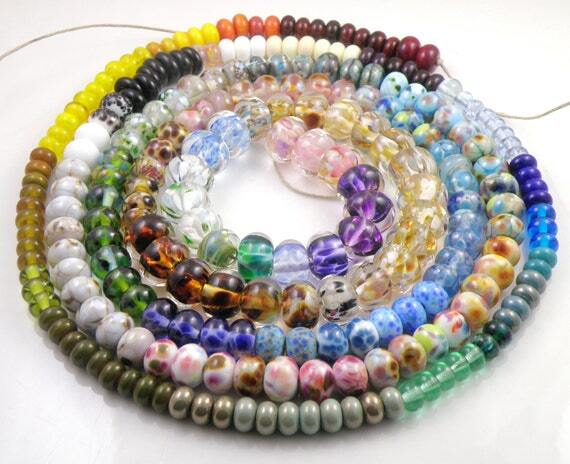 Boxing Weekend Lampwork Sale – 50% off http://lampworkbyamy.etsy.com/ and 20% off http://madeforyoulampwork.etsy.com/ – come grab some beads! Starting at midnight and ending Sunday night. Starting Friday at midnight, going until Sunday at 11pm. Score some great deals just in time for the holidays! And please share this post with your friends if you think they might be interested Thank you so much for your support and happy holidays! Christmas time is coming And it’s Black Friday this week. Not that we really do that in Canada but, well, we sort of do. I’m having a big sale in my main Etsy store to clear out some stock and make a few extra bucks for Christmas shopping. This will only apply to ready to ship items and not custom orders, and only my shop at http://lampworkbyamy.etsy.com/ These are some crazy good prices though and I have a lot in stock, so please pop on over starting at midnight tonight (12am Friday morning) and will go until Sunday at 11pm (both PST). I’m using Etsy on Sale so the prices will be automatically adjusted when the sale starts – you won’t need a promo code or anything. Hope you enjoy and Happy Holidays! I’ve been doing a lot of made to order work lately and the result is… orphan city! I usually make at least a few extra beads for every set that I sell made to order – I select the best/most matching ones and that’s what gets shipped out. But then I have so many leftovers, which is great because I know there are lots of you out there who aren’t as picky about exact matching shapes/sizes and colours, and who love an awesome deal. This is really unbelievable value. A new orphan lot looking for a home. Available on Etsy. Enjoy! Here is a frit blend that is NOT a new one… but new to me (or rather, I hadn’t had much time to play with it). Here are some preliminary results. I really love the rich contrasting colours in this blend. Buy this frit blend at ValCoxFrit.com!